A fan of Bargello quilts, designer Mabeth Oxenreider shares tips for creating them using quilts she's made to illustrate the ideas. Mabeth likes to watch the waves and curves develop as she lays out and assembles her bargello quilts. "I pin my pieced strips on a design wall and move them until I'm pleased with the arrangement," she says. 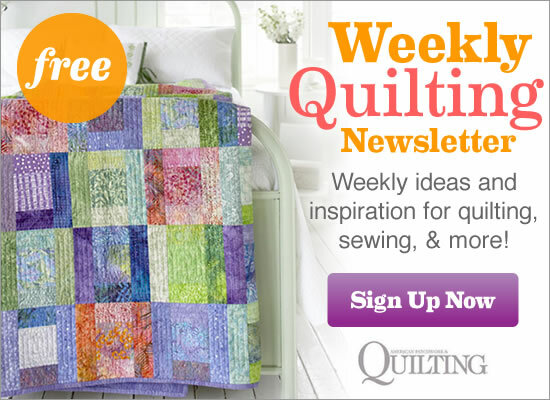 "Excess strips can be used for another quilt, so don't use strips that don't look right to you." "Pick fabrics with a lot of visual texture as they add interest and color movement," Mabeth suggests. "I love the way batiks work in stratas, or strips. The subtle variances in color flow from one row to the next." Mabeth says, "When arranging fabrics for a bargello quilt, keep in mind that the first fabric will be side by side with the last fabric in the finished quilt, so choose fabrics that look good together." To keep things organized, consider making a chart to show fabric placement and labeling your fabrics. When working with a collection of fabrics by a specific designer you may not have the "flow" of a more randomly selected fabric grouping. Mabeth recommends laying the collection of fabrics on a table, letting about 2" of each show. Keep overlapping until you get your desired effect. "Make sure that each color segment is not made up of the same number of fabrics," she says. For example in Jewels, the primary color is amethyst, with topaz and peridot as the supporting cast. If you end up with leftover strips, use as accents on pillows or save for future projects. "Cutting narrow strips allows the color to travel up the quilt faster and wider strips add width and move more slowly through your quilt," says Mabeth. Don't worry if you make a mistake cutting, in most cases, it will not show. When determining the width and placement of the stratas, Mabeth suggests having wider strips on the outer perimeter of the quilt. Narrow strips can be more difficult to handle and adding a border becomes tricky. The appliqué border on Tropical Paradise beautifully frames the rolling strips of vibrant color. Retired Quilt Shop Owner Makes 60 Quilts A Week for an Amazing Cause!